It seems that now the new iPad has been officially launched and available for almost a week, it is Samsung’s turn to be subjected to the never-ending rumor mill. In particular, attention is being paid to the Korean giant’s up and coming Samsung Galaxy S III device which will take over from the extremely successful S II model, with Samsung hoping it will fly the flag for the company in the twelve months after launch. We were originally all set to see a preview of the S III at the Mobile World Congress last month, but Samsung chose to delay that in favor of unifying the global launch of the device later in the year. While the Samsung and Android loving world wait patiently to get an official glimpse of the new kid on the block, that hasn’t stopped the world wide web from going speculation crazy and leaking alleged images of the device as well as accompanying those images with purported technical specifications. Over the last few days we have seen a number of image leaks coming from various sources which show differing views of the handset, meaning that someone is telling a few untruths. Today we are seeing yet another image coming out of the woodwork, which is said to be an official press release render and actually bears a striking resemblance to one of the earlier leaked photographs. The image that was doing the rounds earlier in the week seemed to have styling taken directly from the Galaxy S Wi-Fi media player, something which that and this so-called official press render have in common. This could indeed be an official image which has managed to escape the clutches of Samsung, but as is always the case with these things; we need to wait until the official announcement before we can be 100% certain about what the Galaxy S III will bring to the table. 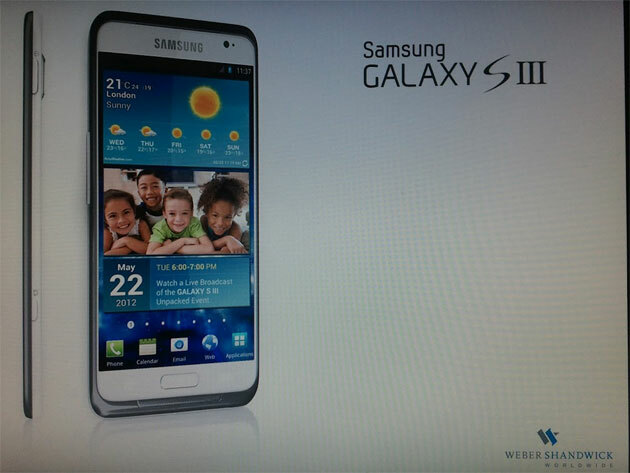 The leaked render also comes attached – and once again alleged – with specifications that show the S III will be more than able to compete if the current market if they turn out to be accurate. 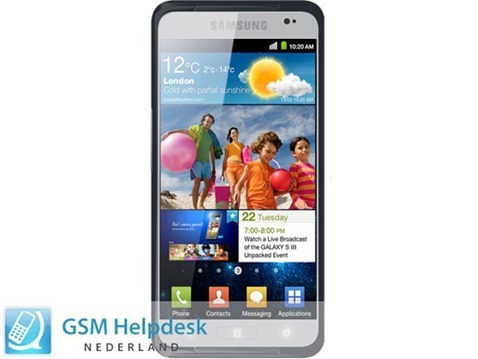 If true, the Galaxy S III will feature a 4.7 inch Super AMOLED HD screen which packs in 720p resolution and 331 pixels per inch. The device is also rumored to have a 12 mega-pixel rear camera capable of 1080p video recording at 60 frames per second with the inclusion of some pretty cool built-in features such as time-lapse and slow motion capabilities. Samsung are also reportedly including a quad-core processor clocked at 1.5GHz and could be of the Exynos variety as we have already mentioned. In addition to the speculated quad-core Exynos processor, we could see internal storage of up to 32GB with the inclusion of a whopping 1GB of RAM. For those that take the Apple view on press release images, you will of more than likely notice that the display on the device is showing ’22 Tuesday’ which could possibly mean it will launch on Tuesday 22nd. The next Tuesday which actually falls on the 22nd of the month is towards the end of May, so could we possibly see a launch or announcement in May, or could the display graphics be totally irrelevant? Well, if the President of Samsung China is to be believed then it looks as though the launch was set for May, but could be brought forward by the company to sometime next month. Speaking to the Beijing press, Kim Young-Ha has stated that the company will seek to be more aggressive and go after acquiring a higher market share, with the Galaxy S III featuring heavily in those strategic plans. Each individual will draw their own conclusions about the latest leaked render, but with one of Samsung’s top executives starting to make noise about the launch of the S III, it looks as though we shouldn’t have to wait to long until we can get our hands on it.